Oberleutnant z. S. Gerhard Seehausen relieved Markworth as commanding officer of U-66 after the eighth patrol, and Oberleutnant z. S. Ketelsen succeeded Schütze as second watch officer. A reservist, Oberleutnant D. R. Steinhilber, joined the boat as supernumerary watch officer and presumably would later have become executive officer had U-66 not been sunk. Four patrol vessels accompanied the U-boat as far as Ile de Croix, when on Sunday 16 January 1944 at 1700 U-66 began her ninth and last patrol. She proceeded on course 2700 at a speed of 12 to 14 knots and did not dive until dawn the next day. During the passage of the Bay of Biscay only one plane was seen, and U-66 dived without being attacked. After keeping course 2700 for almost two weeks, course was altered to 2200 until passing the Azores in late January. 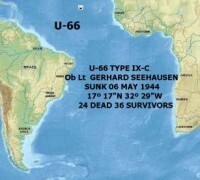 In this area likewise only one plane was seen, and this time U-66 continued without diving. After the Azores a course of 1200 to 1300 was maintained for several weeks. Off Dakar a rather large convoy was sighted headed for Dakar. A plane and a destroyer drove the U-boat away from the convoy, although one T-5 torpedo was fired at the destroyer without noticeable effect. U-66 dived to 120 meters and moved off slowly to the west. About two weeks later a 7,500 ton tanker was attacked with three torpedoes but apparently not sunk. U-66 lay on the bottom at a depth of 80 to 100 meters for about 6 hours and then proceeded west. Early in April a convoy bound for Lagos was sighted off Cape Palmas but not attacked. (It was stated by prisoners that U-66 never had luck except on Saturdays or Sundays.) 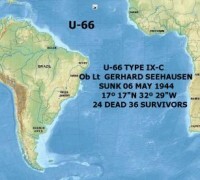 U-66 had only five or six torpedoes left and was beginning to run short of fuel and provisions. Late in April, the engineer officer, Olschewski was notified by radio of the awarding of the Knight’s Cross of the Iron Cross. It had been arranged for U-66 to meet the U-boat commanded by Studt at dawn 26 April in approximate position 180 North – 350 West. At about that time it was noticed on U-66 that an attack was going on nearby; 6 to 8 depth-charges were heard. At 0300 German Summer Time U-66 sent a message to Control: “At rendezvous today at 0900. Supplying impossible. Flares seen. Noises of a sinking heard. ------fuel and 8 days’ provisions. Am moving off”. On 28 April the following answer was received: “Henke at rendezvous so and so by 1 May. If not met, then report.” (O.N.I. Note: U-515 under Henke had been sunk 9 April.) On 2 or 3 May at 0200 to 0300 U-66 reported as follows: “Henke not met.” The following day the following message was sent out by Control: “Lauzemis and Lüdden go immediately to Seehausen and supply minimum needs of fuel and provisions.